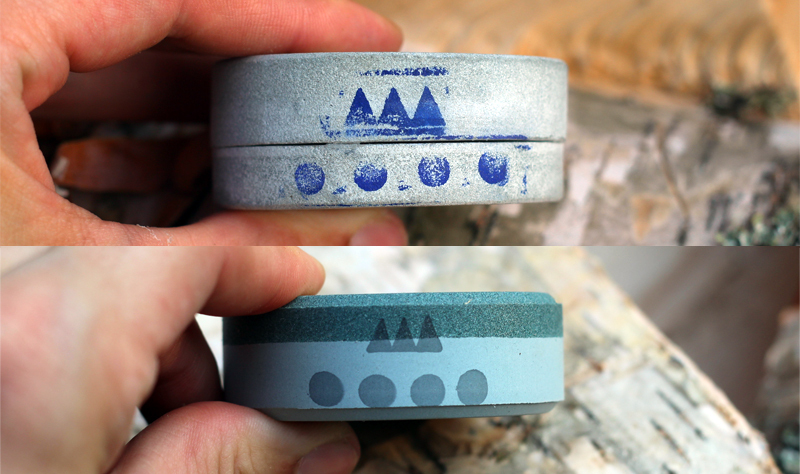 The Gränsfors Grinding stones by swedish axe manufacturer Gränsfors Bruk are light and compact sharpening stones and are said to be ideal for sharpening axes in the field, in the woods or at home. 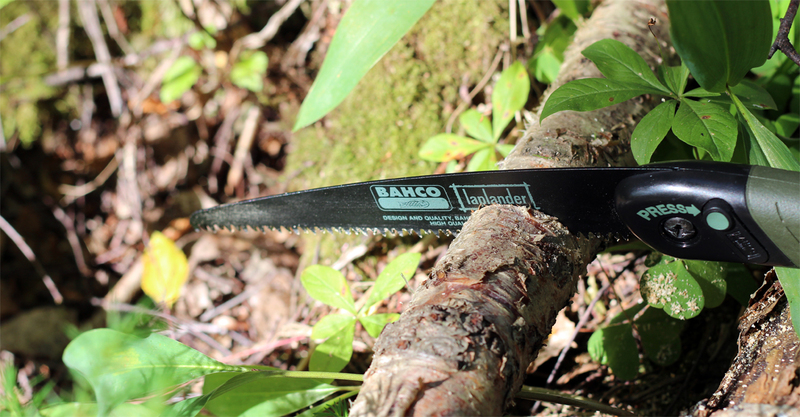 They’re best used to remove minor dullness and for ongoing maintenance sharpening on axes and other edge tools with straight or convex edges. Now, when you search for their grinding stone you might see two different versions; one made of natural stone and one made of ceramic stone. The one made out of natural stone is harder to get your hands on because the supply of natural stone from the swedish island of Gotland is scarce and so the production has essentially stopped. The two stones are said to be identical in function though, including the two grits. I’ve tested both of them and here are my thoughts. I can tell you straight off the bat that these grinding stones won’t help you repair a severly damaged edge. For that you will need to use a file or a grinder (however take care not to overheat the steel because then you can ruin the hardening and make the steel brittle). With that said, both the natural and ceramic grinding stone do an excellent job at sharpening edges exposed to normal wear and tear. Both versions have the same grit, two sided with coarse (180 grit) and fine (600 grit). Where they differ however is the ratio of fine versus coarse material. On the natural stone the fine side is 1/3 of the thickness but on the ceramic stone it’s the other way around where the fine side is 2/3 of the thickness. The fine side is marked with circles and the coarse side with triangles, as seen in the photo below. Top: Natural stone. Bottom: Ceramic stone. Gränsfors Bruk says that the fine side is now 2/3 of the thickness on the ceramic stone because that’s the side that sees most frequent use and is worn down most. Makes sense. You won’t get a mirror finish on your steel with these stones, in fact it will make the steel look a bit “hazy” because of the circular motion when sharpening. So don’t use this to sharpen your finer blades. But together with a leather strop you can get a razor sharp edge. So to sum up, don’t expect these stones to repair heavier damage but see them for what they are: sharpening stones for bringing back a sharp edge from normal wear and tear. If you buy them with those expectations then I don’t think you’ll be disappointed. First let’s take a look at the grinding stone made of natural sandstone. The sandstone is quarried on the island of Gotland, Sweden, and it has two different grits, coarse (180 grit) and fine (600 grit) where the two sides are glued together, and has a slightly bevelled edge to prevent chipping. Being cut out of natural stone like this I would guess they don’t have millimeter accuracy, because from side to side there’s a difference in thickness of 2 mm. The total thickness is 23.5 mm so 2mm is a noticeable difference. It doesn’t affect the function however, and aside from that it feels like a solid build. The only question mark is the glue that’s used to glue the two sides together, but if they happen to fall apart many years down the road you can just glue them together again. Now onto the ceramic stone. It has the same grit, coarse (180 grit) and fine (600 grit), but in contrast to natural sandstone a ceramic grinding stone can be given a more precise grain size. Plus you don’t have to dig it out of the ground from a finite supply of stone. The ceramic composite material also makes the stone both durable and strong, and it has a more pronounced bevelled edge than the natural stone so it should be even less likely to chip. It’s thinner than the natural stone however, 20 mm versus 23.5 mm. How that translates into longevity I can’t say, but on a positive note it does make the ceramic stone a bit lighter to carry. Every gram counts. Both stones comes in a protective rubber case that feels sturdy and is useful as well, because it gives a good grip both in your hand and when you put it down on a flat surface. The stones are normally used with water but can be used dry. To sharpen, moisten the grinding stone with water and move it along the edge in a rotating motion, making sure you always keep the original shape and angle of the edge. 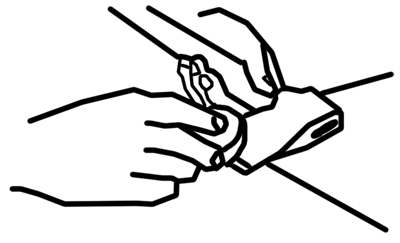 It helps to put the axe on the side of a table, as in the illustration below. Move the stone along the edge in a rotating motion. If you hold it as in the image above then you barely have to apply any pressure. The weight of the grinding stone itself is enough. Hone along the edges of the stone rather than in the middle to avoid gradual cupping of the stone. Turn the axe frequently and hone both sides to remove the feather edge. Wipe off the stone occasionally so that the burrs do not damage the edge. Also give the stone a thorough wipe down before putting it away. Once you get a feel for it you’ll find that it’s very easy. Aside from wiping off the grinding stone occasionally during and after use there’s no maintenance involved. There’s no information on their website about a guarantee, so I gave Gränsfors Bruk a call today. The nice lady that I talked with could not tell me if they had a guarantee or not on their grinding stones (wrong department, and everyone else seem to be on vacation), so I’ll have to wait a few days until they get back to me. I’ll update this section accordingly. As mentioned it’s increasingly harder to get your hands on the grinding stone made of natural sandstone because of supply issues of the raw material. So obviously that was not a sustainable choice of material. That’s why they developed the ceramic grinding stone as a replacement and more sustainable material for the long term. They faced a sustainability problem so they adapted and overcame. That’s good news for Gränsfors Bruks fans. 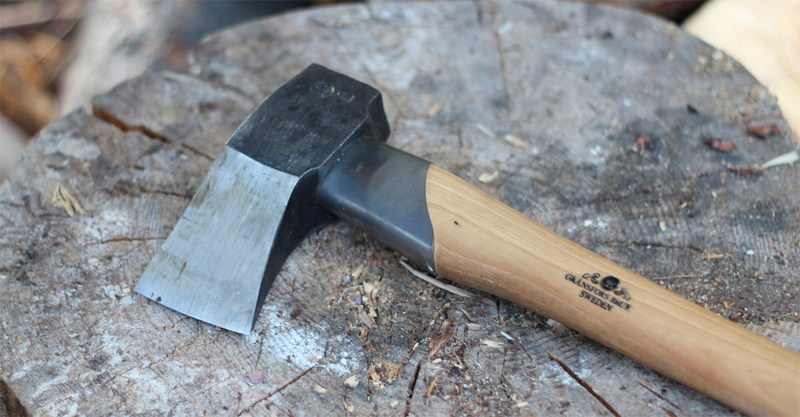 Keeping your tools in tip top shape is an essential requirement for self-reliance, and the Gränsfors grinding stone will help you keep your axe sharp. It’s not an all encompassing sharpening solution though. You’ll still need an axe file to take out those larger damages to the edge. But for maintaining a sharp edge on a daily basis this stone will go a long way, and will last you for years and years. In the US the ceramic Grinding stone will set you back $45 at Grand Forest Inc., which is the official distributor for Gränsfors Bruks products in the US. And it’s roughly the same price in the UK, around £26-29. So this is quite an expensive sharpening stone. Compared the $45 to the $6.89 that you pay for the Lansky Dual Grit Sharpener on Amazon, which is of similar form and function. I don’t doubt that the Gränsfors Grinding stones will give me years and years of sharp axes, but I do doubt that it’s the bang for your buck. Because for the price of one Gränsfors Grinding stone ($45) you could get a Lansky Dual Grit Sharpener ($6.89) AND a Nicholson 8-inch axe file ($10.99) AND Smith’s TRI-6 Arkansas TRI-HONE Sharpening Stones System ($27). That feels like a much better deal to me, because for the same price you get an axe file for when you need to repair more serious damage to the edge, a sharpening “puck” for the fine sharpening, plus a complete sharpening system with Arkansas stones for your other edged tools. So if I only had $45 to spend on sharpening tools I’d pass on the Gränsfors Grinding stone. If I was a sharpening or axe fanatic however (which I happen to be), then it’s easier to justify the $45. To a degree I take the high price as a sign of quality, but I’m sure part of the high price is just because it says “Gränsfors Bruk” on the rubber case. If not for the high price this would be a winner for me, but the price does bring down my excitement quite a bit. But I still found this grinding stone to be effective and ideal for sharpening both in the woods and around the homestead, and the rubber grip makes it a pleasure to hold in my hand. I don’t know why, but for some reason I like the natural sandstone better than the ceramic one. In terms of sharpening the ceramic stone should be better because it’s a more even grit, but in terms of feel the natural sandstone wins for me. 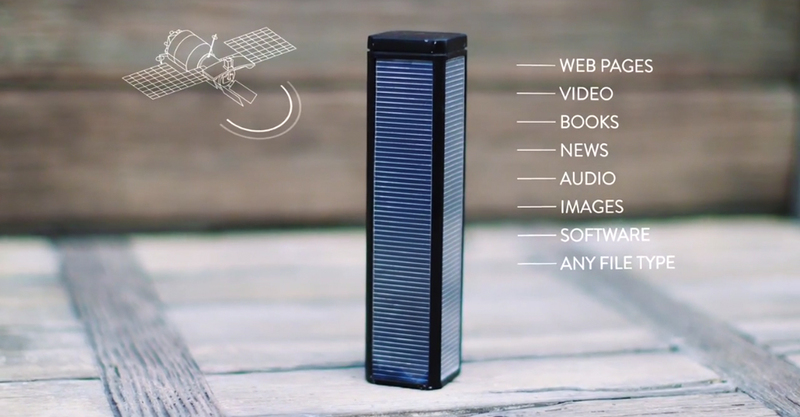 Free Data From Space Forever – Is Lantern The Holy Grail of Off-Grid Communication?